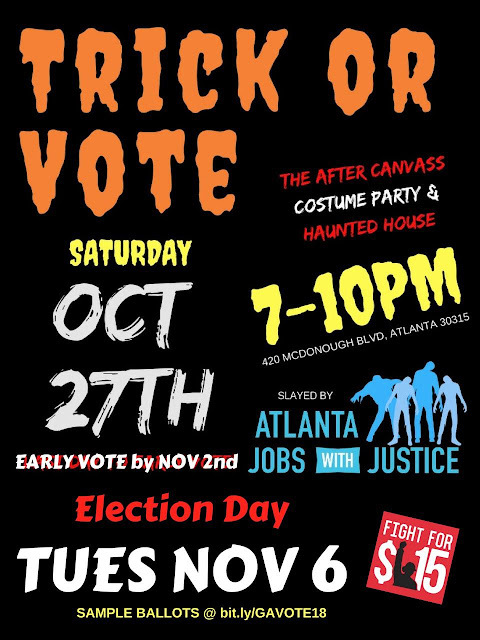 Join Atlanta Jobs With Justice for a spooky (but fun) evening celebrating the hard work our community is putting into getting out and voting this midterm. On the last Saturday of early voting in Georgia we will host an after canvass costume party complete with food, drinks, and a haunted house featuring political issues scary enough to go vote!! Go Canvass, get your friends and family to the polls, then Turn up for fun with all the squads that have been killing the pavement this cycle. Bring your kids, family, friends, and let’s get spooky together as we enter the final stretch. 9 AM - WORKERS 2 THE POLLS!!! May 1st is International Workers Day!! Working people will not be ignored this election May 1st. We are Voting to Evict Corporate Greed from Georgia. GA has been #1 for business while workers rights, safety, and wages are at the bottom of barrel. For the glory of God the state minimum wage is $5.15. 2 million Georgia Workers earn less than $15 an hour. Living wages and Job security are a dream vs a guarantee in Georgia! 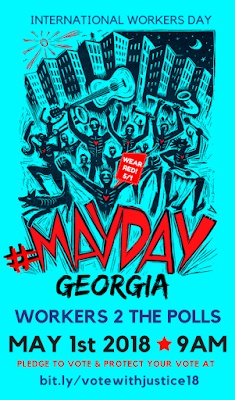 On May 1st we take action at the polls and in the streets to EVICT CORPORATE GREED AND PUT GEORGIA WORKERS 1ST. We demand candidates have a vision for expanded human and civil rights in Georgia. May 1st we will make it clear working people will be Voting with Justice every election in 2018! black, brown, women, immigrant, LGBTQ, elders, youth, homeless, sick, retired, unemployed, workers with disabilities, all workers earning less than $15! Everyone who is ready to struggle less is VOTING! WE ARE READY for our values of human life and dignity to be the policies we are winning 2018 and beyond! STAY READY - Make sure your voter registration is up to date at www.mvp.sos.ga.gov and your shoes are laced up! 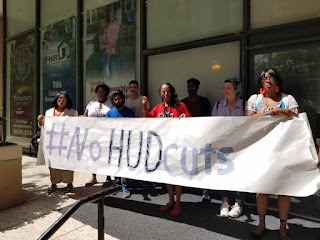 11 AM - TENANTS SAY NO TO TRUMP'S HUD CUTS! Trump's purposed cuts to HUD would effect 58,400 working class households in Georgia and bring a 38% rent increase to affected households. This International Workers Day all DeKalb County employees are invited to join AFSCME Local 3 and DeKalb County Elected Officials to discuss the issues and challenges workers are facing working for DeKalb County. We are also encouraging all DeKalb Bus Drivers to take part in this meeting to call on the DeKalb school system to reinstate the fired bus drivers and to fully address the wage concerns the bus drivers had. 2018 Q1: We've been in the Streets and Working with Our Partners! 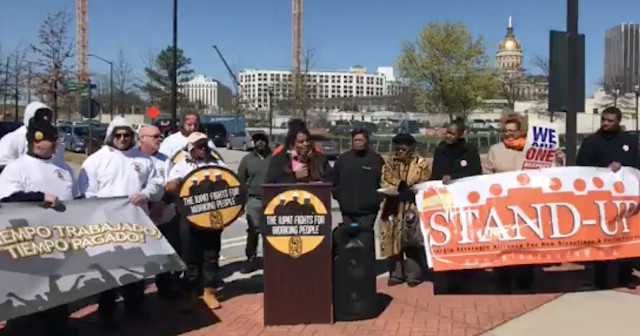 Atlanta Jobs with Justice has been busy in the streets and collaborating with our partners since the start of 2018. Here is a brief update of what we've been up to for the first quarter of 2018. 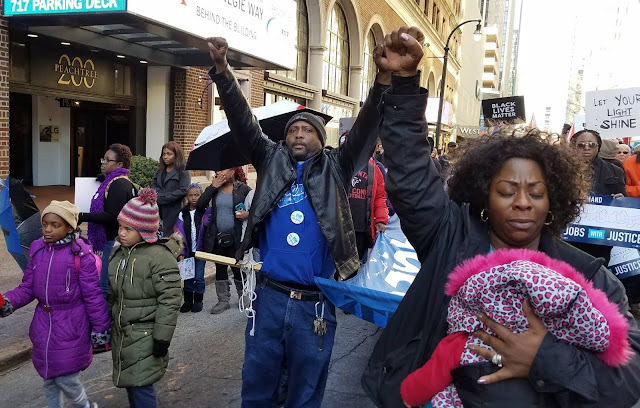 We started off the year with our workers and family members coming together for the annual Atlanta MLK March in Atlanta to fight for MLK's vision of justice, freedom, equality, and fair wages for all! That is why we #FightFor15! Atlanta Demands Poverty Creator Chick-Fil-A Pay $15! We kicked off 2018 with an action to demand that Chick-Fil-A pay $15 an hour to its employees. Atlanta community members watched as Dan Cathy, CEO of multi-billion dollar low-wage employer of Chick-Fil-A, spun the opening of his new Vine City Chick-Fil-A into a corporate PR stunt that supposedly involved 30 CEOs camping overnight before the opening in order to urge the “revitalization” of Atlanta’s Westside and call attention to homelessness. 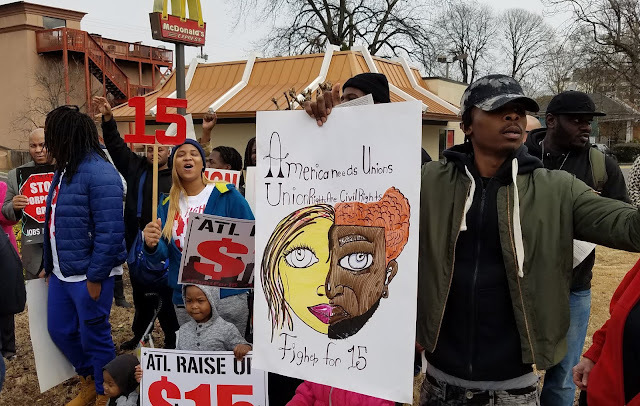 The Atlanta community could not accept the hypocrisy of this company and its CEO and immediately called on Chick-Fil-A to start paying $15 an hour to make sure their workers don't have to continue making poverty wages. 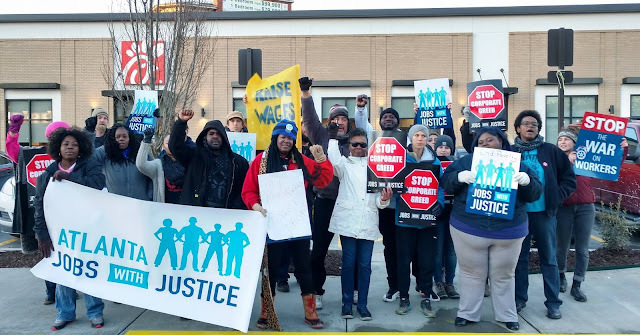 Atlanta JwJ 2018 Strategy Social & New Office Grand Opening!!! We continued to kick off the year by opening up our new office to the public for its grand opening on January 30th. We invited Atlanta community leaders and our coalition members to come see our new office, to showcase our plans for 2018, and to discuss how we can come together to and support each others efforts and plans of action for the year. Georgia Stand Up, The Poor People's Campaign, Fight For $15 and Atlanta Jobs with Justice came together to kick off Black History month and take action on Transit Equity Day at the Atlanta City Hall and the Georgia State Capitol to promote public transit as a civil right and deliver the demands of the 2018 Poor Peoples Campaign. We organized the Work2Win 2018: Race, Gender, and Economic Justice Retreat to build up a brand new crew of young women of color leaders. 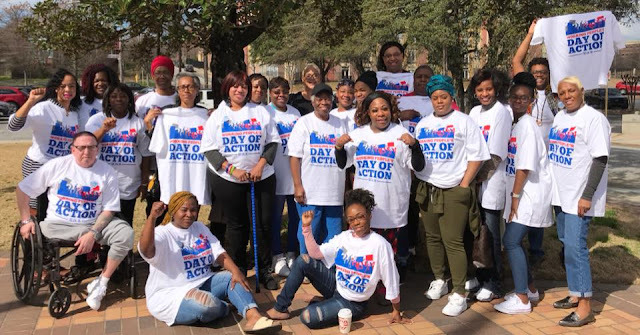 These women completed a three day intensive mind, body, and soul economic justice training and retreat that culminated in joining the national Working People’s Day of Action in solidarity with all our Union coalition partners! 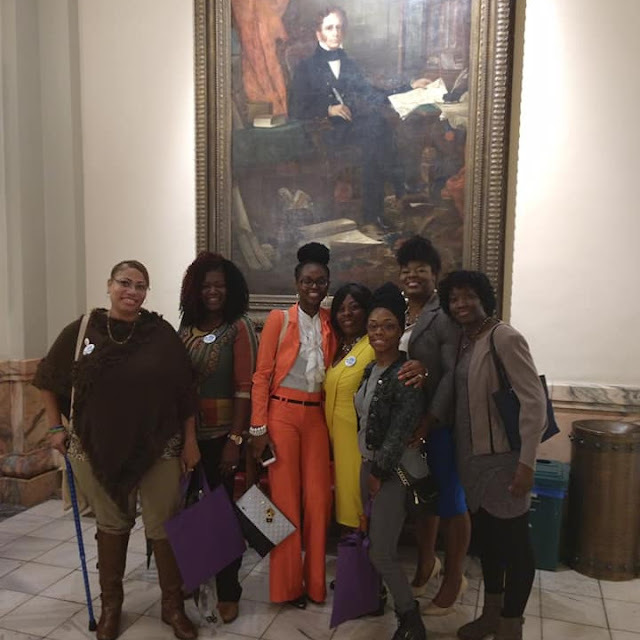 On February 28th, the last day of Black History Month and to open Women's History Month, black women from Georgia came together at the Georgia capitol to make it clear that 2018 is the year for black women's economic, reproductive, and social justice issues to be the agenda that Georgia answers to. 2018 is the year to hear black women's demands and to follow their lead. Atlanta JwJ stood with the Painters Union IUPAT DC-77, Georgia Latino Alliance for Human Rights, Atlanta Labor Council, and Georgia Stand Up for the launch of the Time Worked, Time Paid campaign dedicated to stopping wage theft in the Atlanta area and making sure that workers get paid for the time that they work. Spend your last Saturday in 2017 Celebrating 30 Years of Atlanta Jobs with Justice! We are proud to celebrate and honor 30 years of Atlanta Jobs with Justice! 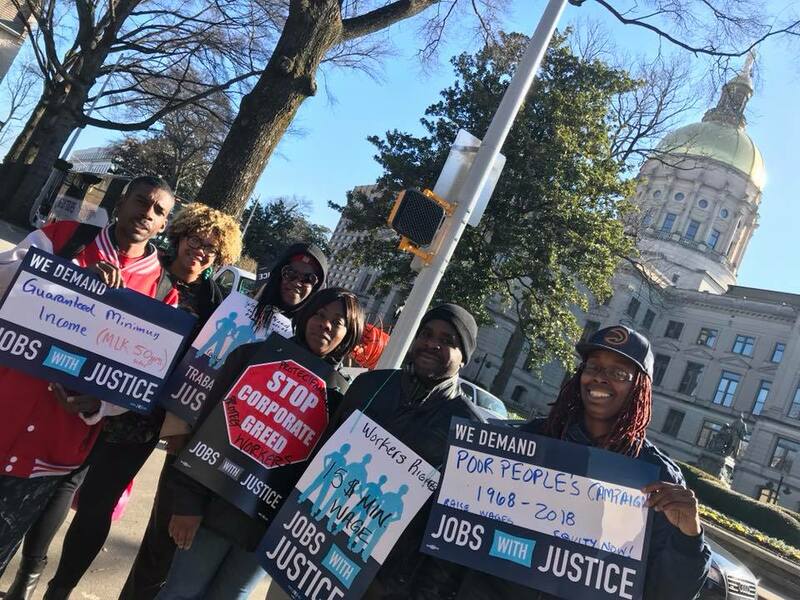 From 1987 until today in 2017, Atlanta Jobs with Justice has been working as a coalition with progressive grassroots leaders across Atlanta, bringing together labor unions, community based organizations, faith based organizations, youth organizations, and individuals to lead and support campaigns for economic and social justice in our workplaces and in our communities. This December 30th, 2017 we launch the next 30 years of Atlanta Jobs with Justice as we celebrate with a fancy New Year's Eve-Eve Organizers' Ball. In honor of our resilience, we will celebrate at the Westin Peachtree Plaza Hotel in Downtown Atlanta. We first demanded justice with Westin workers in 1987 and we stayed on them for 20 years until they unionized in 2007. Congrats to our partners at UNITE-HERE 23, this is also their 10 year anniversary at the Westin! We a very excited to PARTY in this union hotel. We look forward to getting fancy with all our friends, family, and coalition partners to celebrate together, reliving and retelling the stories and struggles we have been through together over the years! 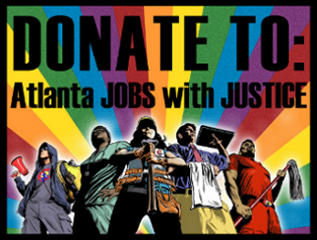 Atlanta JwJ Membership: Become a member of the Atlanta Jobs with Justice coalition as an individual or organization. Organizers' Ball Sponsorship: Sponsors of the 30th Anniversary Organizers' Ball are honoring the legacy and investing in future growth of Atlanta Jobs with Justice. We are winning on the frontlines in the Fight For $15 in Georgia. Together, with your sponsorship, we will hold the line and push forward on our agenda for economic equity in 2018. You can buy multiple tickets, memberships, or sponsorships by increasing the quantity when you purchase them at: bit.ly/AtlantaJwJ30Year. Solidarity Sponsors can receive 2 Dine & Dance or 4 Party People Tickets. All Sponsors $5000 and above can receive 10 Dine & Dance Tickets or 20 Party People Tickets. Is your candidate a CHAMPION or SUPPORTER of Justice? Find out in the 2017 #VOTEwithJUSTICE Elections Catalog! We have been hard at work with our coalition partners making sure issues and real justice solutions stay central in the upcoming November 7th Elections. 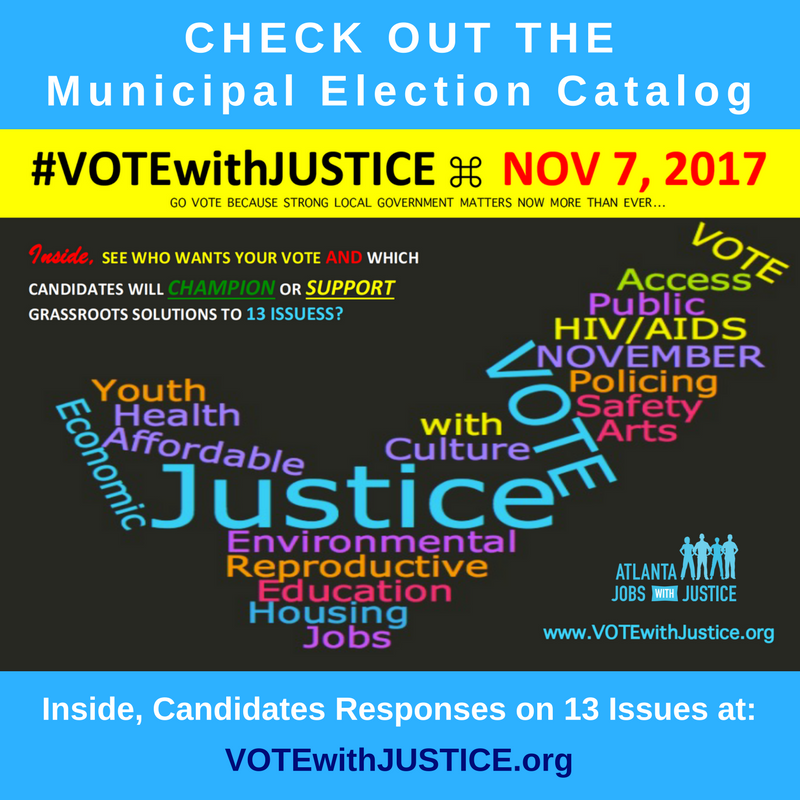 We are excited to announce that the 2017 #VOTEwithJUSTICE Municipal Elections Catalog is finally here. Is Your Candidate a CHAMPION or SUPPORTER of Justice? *Candidates who supported this question have all stated it was done in error and they are fully opposed to any and all forms of discrimination against LGBTQ people. 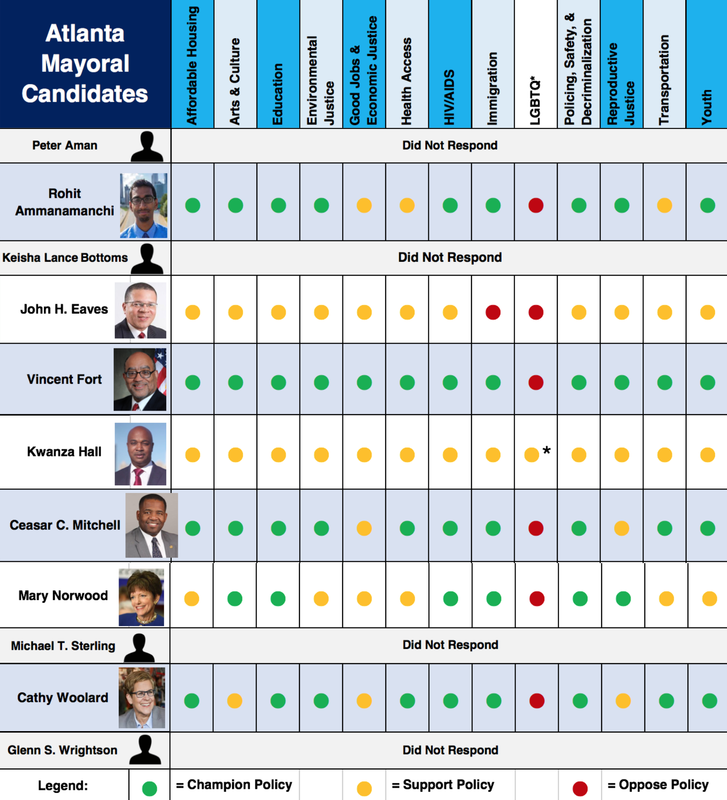 A no (oppose) vote is often a vote that protects our communities. Check out and share their answers from the Atlanta JwJ Facebook Page. Also, you can call us at 404-913-9595 to request paper copies. JOIN THE ATLANTA JwJ STREET TEAM!!! Join us on the doors we need your support!